Dem little bastards...!! Took this picture many years ago. Update! It's that time of year again, so thought I'd update this topic! It had sunken to oblivion and i see some mite topics pop up here and there. I haven't had a mite infestation in many years, and I have frequently been asked before what I do for mite prevention. Since it was treating time again recently, thought I'd take a few pictures and share the way I treat (/preventively) against mites. My hatred against these tiny walking pieces of cr*p runs deep, and my method might be a tad of work but i think it's worth it. This is my personal way, not everyone might agree and/or work the same. I am not a fan of harsh chemicals, since I have seen what it can do to your animals.. I can tell you from personal experience, this method works for me and has worked for over a decade. First of all, New animals i get are treated as if it has mites, they immediately get a bath and i check the water, then they are housed on crisp white paper for at least 3 months. They get either a clear glass or a white water-bowl, to make noticing mites easier. This should cover the the life-cycle of the blood-mite in such a way, that its nearly impossible to miss them as long as you're paying close attention. During this period i regularly check the paper/dish and the snake its self for mites, on the snake i make sure to check the vent / eyes and any other crevice.. Call me crazy but I'll use a loop if i have any doubts! I think it goes without saying I house my quarantined animals far away from the rest, preferably on a different floor in my house but at-least in a different room with their own tools etc etc. About half the snakes i have quarantined turned out to have mites, especially the ones from renowned breeders (such large collections are nearly impossible to keep clean)- do not mean anything degrading by this, just stating my experience. With about +/- 40 adults in my last collection it was pretty hands on to keep the mites away, can't Imagen how much work it would be for the even large collections. If it turns out the animal indeed has mites, i use diluted nix human lice shampoo to treat it (Nix is a brand here, it doesn't have to be nix, loxazol is fine too, or any lice shampoo that works with Permethrine (1%)). I dilute it 50Ml to 1,5L.. which would be about 2 Tablespoons full to 50.oz of water (Convert yourself for exact numbers). This is very mild compared to most treatments that use insecticides, I have not heard of it causing any health issues (Besides with hognosed snakes! Do not use anything with Permethrine with hogs!). This way could be also used to treat mite infections in terrariums, the downside being you have to throw away your substrate, and it is a very hands-on method. 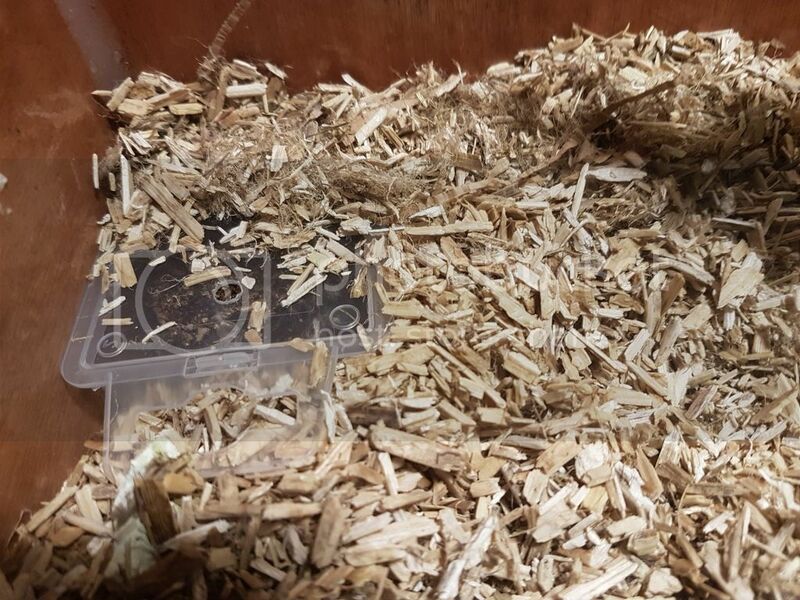 You use it like this: Scrub the enclosure clean with water and dry it out, then spray the solution in it and let it air dry same with hides etc. Give your snake a good luke warm soak first, wipe the animal fully (besides the eyes) with a rag soaked in the solution. It is not irritating, but do not provide with a water-dish for 2 days. They should be hydrated enough from the bath, they can easily last 2 days without. After 2 days give a waterbowl big enough to drink from, not to bathe in. Repeat after 10 days, 3 times (A 30day treatment) During treatment I also smear olive/corn oil around the glass sliders / edges of the windows / ventilation / edges of the tub, this is completely gross I know but the mites will get stuck inside the oil and die in stead of being able to escape. This prevents them from coming back from outside of the terrarium. It is also harmless if the animal happens to get any on its scales or even in its mouth/eyes. (Do not bathe the animal in oil though). Check of the oil needs refreshing regularly, if it gets too dirty mites can walk over the dirt. Other types of prevention i use, if any of my friends who have reptiles of their own come over. I always ask them to take off their shoes before going upstairs, also to thoroughly wash and disinfect their hands/arms. I do not let just anyone up stairs, for example if a buyer comes a long I'll make sure to have the animals that are for sale downstairs. If they request to see the parents I ask them to do the same thing as i do my friends, but I wouldn't let them handle any animals or even open the enclosures. If I have been to a reptile store or expo, I make sure to wash up and change clothes before handling any of my animals. Any tools I don't use any-more i spray with nix before storing them, same with enclosures or any other reptile related items bound for storage. I also spray the floor lightly after a big cleaning (unless I plan to use predatory mites) It smells pretty great! Preventively treating all my animals against mites every year is something i swear by! !, I do this in a non toxic non invasive way. I release predatory mites into their enclosures, they eat any mite they might encounter and others (harmless but annoying) insects. Since this is not a very well known way of treating them, even though it's a great and natural method without having to throw away any bedding or anything else (Great for bio active substrates!).. I will try to describe to the best of my ability how to use this method. It can be used as a treatment and preventive, I do not use it on newly acquired animals that turn out to have mites, because simply put NIX is a lot faster and they are housed in plastic tubs on paper anyway, no need to waste mites on it. 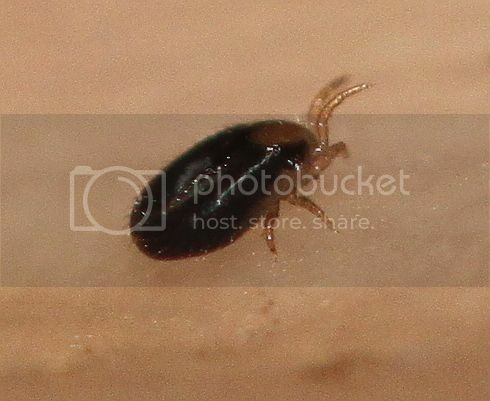 Mites are inactive in temperatures above 25C/77F, they will however become active at night and during the day they will roam in cooler sections and below the surface. 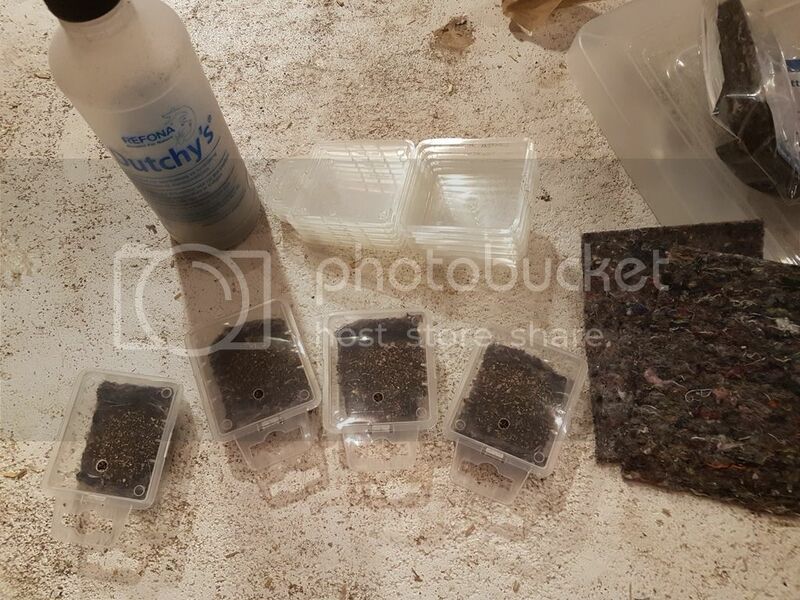 I would not advise using them in dry hot desert terrariums though, better off using something else since they need some moisture and lower temperatures. 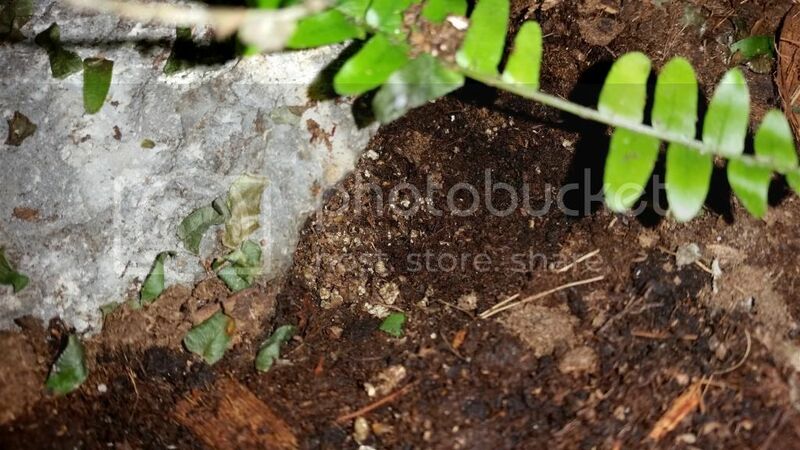 Warning- Do not release predatory mites in an enclosure you have used insecticides on in the past 6 weeks, they are more sensitive to the residue than bloodmites and will perish while the bloodsuckers thrive. So if you want to use predatory mites, let the chemicals wear off or just don't use any. 6 weeks minimum waiting period is required! 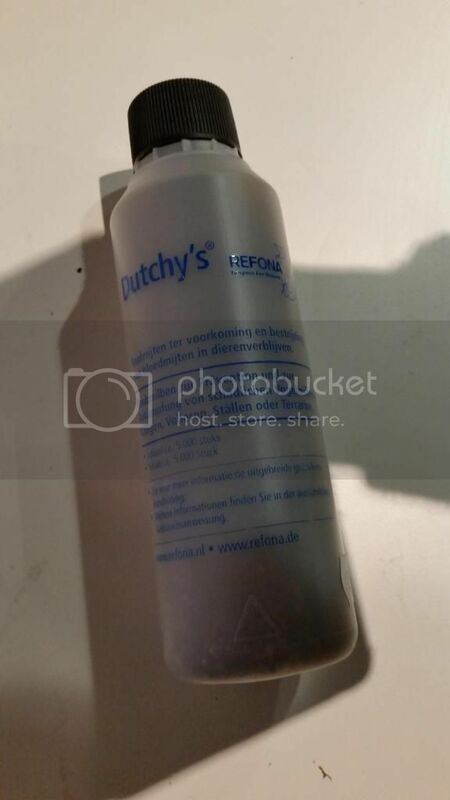 The predatory mites i use are called Dutchy's, and they are sold by Refona. I do not know if they are sold by the same seller across the ocean, but i'm pretty sure you can find them nevertheless. 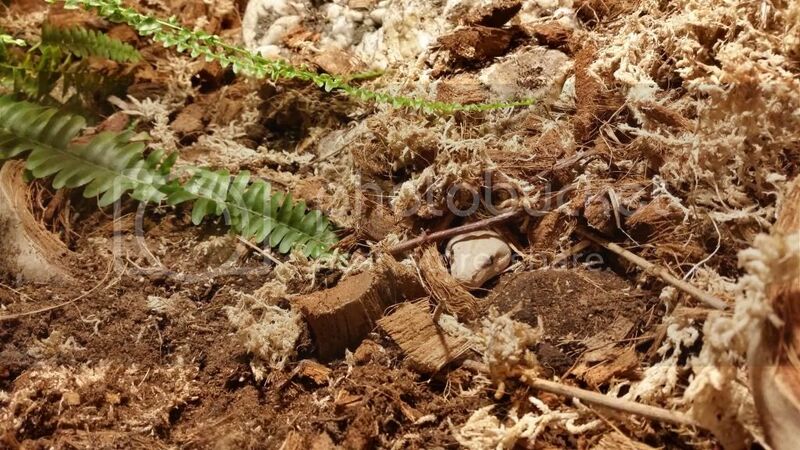 They are often sold as blood-mite prevention for birds-nests, but they work perfectly in a terrarium as well. Dug a little hole and put a bit of the content in there. 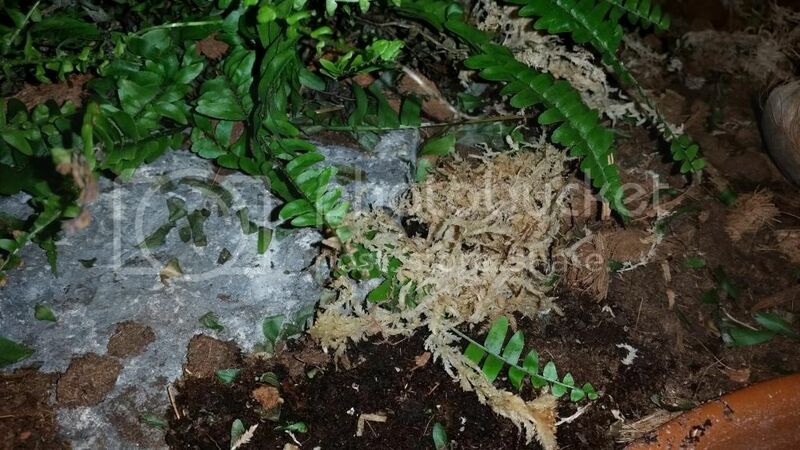 i dug it under a rock so the snake couldn't get too it easily. Was being hunted on myself, she struck at me seconds later, little bish haha! Update!! : This year I ordered Dispensers! I cut up special cloth that I ordered with them to keep some humidity in them so I don't have to disturb the nests too often. I hope this was of any use to anyone, if not.. Eh at-least i tried, right? Last edited by Tsubaki; 11-12-16 at 09:25 AM..
That last picture is awesome. I've used NIX in the past and I'll also vouch for how effective it is. I need to get some more permethrin actually now that I think about it. I ran out the last time I cleaned. Overall we are pretty similar in our anti-mite regimen. But all of my animals get white or off-white (light tan/cream color) water dishes. I also spray the cage as part of my regular cleaning but I don't do a yearly deep clean like you do. I do have quarantine cages that are thoroughly cleaned before and after an animal is in it. I also keep my animals on newspaper which makes regular cleanings easier. This also leads to me not using predatory mites. If I had more natural, bioactive setups I probably would. Thanks, she was even camouflaged a bit because of that white-ish moss! I've had outbreaks before and I don't ever want them again. I've been mite free for 8 months now and I plan on keeping it that way. DIE SUCKERS! DIE! Mites, ticks, mosquitoes. I hate them all equally! I haven't even been keeping reptiles for 4 years, let alone 10! I did get them with my last purchase but like you they were gone within days. Tsubaki...wow! Very nicely done. I'm saving this one. Thx dude! Yep I do the same except for the annual maintenance but will start doint the same from here on out. Cand say enough how great nix works for this issue. Plus its always interesting the reaction you get from the pharmicist when you tell them what its being used for. Priceless!! Something else you can do is mix in some listerine mouth wash for a minty fresh cage smell and use it as a cleaning solution too. That's what I do. This is great. It's wonderful to hear such a detailed well laid out method from someone who has been using it for so many years. I'm about to get my second snake and have been reading a lot about quarantine precautions to take - this was really helpful, thanks! Thanks for the kind words everyone, i am really glad it is appreciated! @MDT, still not a dude, dude but thanks! A decade mite free makes me feel old, i'm not old i just started young.. ~incoherent muttering about not being old~.. This sounds like a perfect solution for those with naturalistic setups! I hope this gets stickied and further tested by other members.